Since your climbing harness helps connect you to the rock, it is important to evaluate wear and tear on a regular basis. If there are any doubts in your mind that a harness is unsafe, retire it immediately. This article covers the basics of harness care. 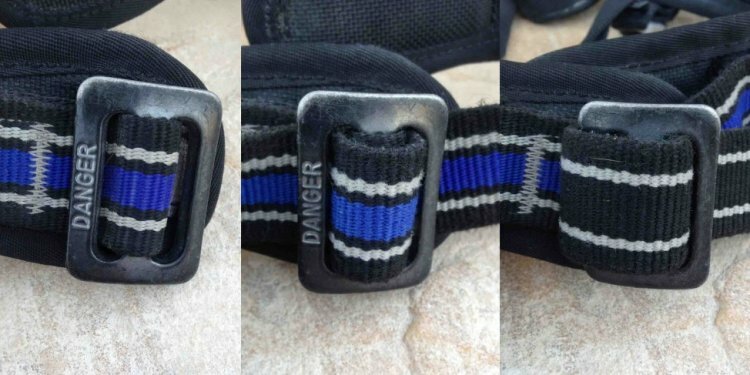 A harness that is well worn is not necessarily unsafe, but excessive fraying and discoloration of the webbing are signs to retire the harness. Some harnesses have orange wear-mark indicators stitched beneath tie-in points and the belay loop to visually help show when the harness needs to be retired. All harnesses’ structural materials degrade over time, so to ensure your safety, retire any harness that is more than 7 years old, even if it has been properly stored and/or never used. For climbing professionals such as mountain guides, or those climbing full-time, it is recommended to retire your harness after 1 year. In the event of a major fall or impact, retire the harness immediately. When your harness gets dirty, try simple rinsing first. If this does not remove the dirt particles, you may hand wash a harness in warm water with a mild soap (never use bleach), then rinse. Allow it to air dry away from direct sunlight. Transport a harness in its supplied bag and always keep it away from sharp objects, ice screws, crampons, direct sunlight, corrosive substances (e.g., battery acids, gasoline, solvents, bleach) or any other potentially damaging objects. If your harness did not come with a bag, a stuff sack can be a cheap and simple solution.